Long-time Monevator readers all know you cannot avoid risk when investing. Indeed, I try to assume that any investment could – conceivably – fail me. Does my maudlin mindset lead me to keep all my money in guns and ammo? All investments can fail me, remember? Heck, maybe my gun will jam. More seriously, assuming failure is possible with everything I invest in or own helps keep me diversified across different holdings and asset classes. You regularly hear horror stories of people putting all their life savings into some property scheme or ‘guaranteed’ bond or offshore opportunity. Madness – even when such schemes are not outright scams. Many of you will be nodding along here. But I’ve discovered one area where quite a few readers think I’m just too paranoid. Which is that personally I would never run all my money with one fund manager, nor keep all my funds with one broker or platform. To me, diversifying against the very unlikely case of major company incompetence or fraud is cheap and simple. Even for the strategically laziest passive investors, monitoring two accounts instead of one should only add 30 minutes or so to your annual workload. Investor compensation under the FSCS is limited to just £50,000 – and that’s assuming you’re even covered. And while I think the chances of losing money with a huge fund house or one of the biggest platforms is very small, the financial crisis taught me that just not having access to my money is scary. I wouldn’t whistle contentedly while waiting weeks or months for all my worldly wealth to be recovered in full. I doubt you would, either. People reply that their assets are legally ring-fenced, so they aren’t too bothered. Of course I’m well aware of this. However things can and do go wrong, I reply – sounding like an Eeyore. Well, in the past few months something has and is going wrong, with the demise of a small broker called Beaufort Securities. Accountancy firm PwC, which was appointed as administrator by the UK’s Financial Conduct Authority, has faced mounting criticism after it said last week that it could cost as much as £100m to return the cash and assets held by the company, currently valued at £550m, to its thousands of private investor clients. 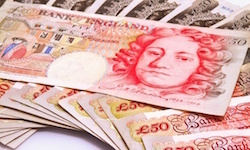 Some 700 clients with larger portfolios — of more than £150,000 in cash and assets — are expected to bear much of the cost. “In the absence of any other available resources . . . the overall costs of delivering [returns] to clients has to be shared appropriately by those to whom the assets belong,” said Russell Downs, a joint administrator and partner at PwC, on Wednesday, citing legislation introduced in the wake of the financial crisis. Repeat: Ring-fenced client money is going to be taken and used, and clients will not get all their money back. The long-time investor Lord Lee of Trafford has tabled a question in the House of Lords about the basis for PwC’s decision. But PwC has insisted there is a legal and practical case for using clients’ money in the wind-up process. No doubt we can have an informative discussion in the comments about exactly what happened here. I’m only familiar with what I’ve read in the press, and am far from an expert on the law. That said, perhaps people will be more reticent to shout “Never!” now this has happened. Besides, the specifics of this case aren’t the point. Next time the specifics will be different. The big reminder is what is important for our purposes: Things fail. Giant investment banks can’t fail until Lehman Brothers failed. Interest rate can’t go to zero until they did. Company pension schemes were safe until some immoral mogul stuck his fingers in the pot. Order reigns until a time of crisis, when anything can happen. Normally we’ll be fine. Virtually always we are. I wouldn’t put all my eggs in any single basket. Are you a Beaufort client? Voices on Twitter are urging you to write to your MP. 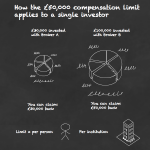 Investor compensation schemes – are you covered? Thanks @Mark, I will take a look. Gold buried in the back garden was one thought. 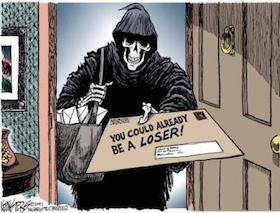 Would you be safer if you were with an insurance company, esp for pensions. I understand insurance products have 100% protection. So the higher cost of say may work pension to my SIPP may actually be worth paying as ‘insurance’ and keep individual SIPPs below £50k. Diversification across brokers, managers (funds and ETFs), custodian banks, sub-custodians, securities lending agents etc. is sensible. This is exactly what the large asset owner/managers do (think state pension funds and sovereign wealth funds). 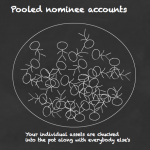 Their ultimate advantage is that they can have named accounts – all the way through to the securities depository (e.g. Euroclear or CREST) – which ringfences their assets in their own name should one of the multiple intermediaries fail. As individual investors we will be within omnibus accounts and nominee entity structures on multiple layers (at the broker, fund manager, custodian and depository). In which case the assets may only recorded in your name at the broker and some level of diversification is advisable. The legal provisions of the nominees, custody agreements, securities lending agreements will generally provide for ring-fencing and repatriation of assets in the event of a winding up. It just may take a long, long, long time. The nightmare issue is the intermediary corrupting the asset owner records (think of a fraud or a cyber-attack that deletes the underlying ownership records of the broker’s nominee account.) Do you have a physical statement from your online broker that will get you your share of the assets – unlikely?! So – if you really wish to follow this path to full diversification – you need to establish and understand the full path to the underlying assets and diversify all of the intermediaries: e.g. Broker – ETF/Fund – Trustee/Custodian. As an example – the LSE listed iShares MSCI ACWI ETF and SPDR (State Street) MSCI ACWI ETF both use State Street as the custodian – so not much diversification there at the custodian level. The Vanguard FTSE All World ETF uses Brown Brothers Harriman – which does not use State Street as a sub-custodian in any location. This type of operational risk diversification is exactly what the large asset owners undertake – depending on your own level of assets and risk appetite you may also want to do something similar. Great comment Howdy. That’s exactly right that institutional investors undertake diversification a cross trustees and custodians. A great deal of due diligence and effort goes on behind the scenes to make sure that assets are as safe as possible. That’s a big improvement over how things were prior to the financial crisis. However, we haven’t seen how these systems and processes work yet in a market turmoil environment. One potential issue is that custodian and agency services are highly concentrated among a few big players (State Street being, I think, the largest). This confers on them a greater apparent level of security. But there are concerns that this concentration could lead to ‘contagion risk’. I agree, great comment Howdy, it’s no wonder forensic accountancy is a growth area! I apologise for this may take some time,my situation is that i have 90k in s&s isa with VLS and Iweb as the platform with another 20 to add. this has been activ for 3 years. 1.who has the money Iweb or Vanguard ( iam alittle uneasy over compesation limits) 2.Which is the best way to rectify. A. Put half in my wifes name ,shedoes not have a s&s isa and invest rest outside an isawith different company andprovider or can i have 2 s&s isa with different providers. Sorry again. Lloyds have shown themselves to be set at zero regards ethics, and have less than zero reputation to maintain, so assume they will do what’s best for themselves. Previous post: Annuities: What’s so bad about a guaranteed income for life?